How Valuable Is a Garnet in Carats? Pink salmon on a white plate. 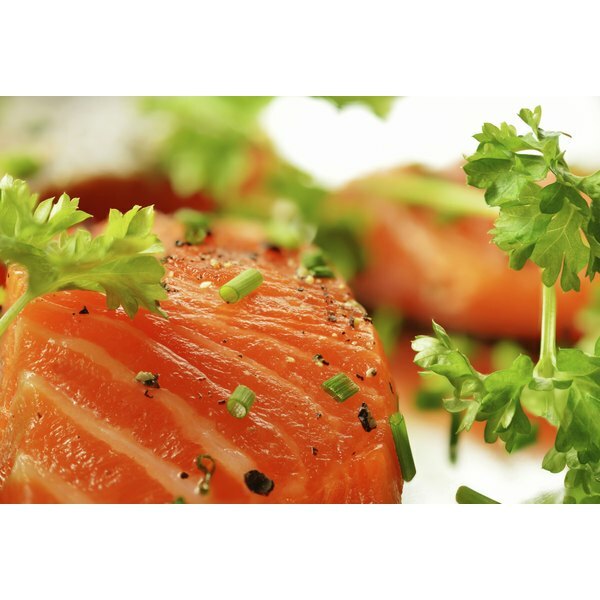 3 What Are the Benefits of Sockeye Salmon? 4 How Valuable Is a Garnet in Carats? Pink salmon, Oncorhynchus gorbuscha, are a bright silver fish with a large hump on the dorsal ridge just behind the head. Called "humpies" by Alaskan locals, they're not considered a high-quality steak fish. However, their meat preserves well and is one of the more widely available canned salmons. The U.S. Department of Agriculture identifies one serving of canned, pink salmon as 3 oz. A portion this size carries 118 calories, of which 46 come from fat. The remaining calories come from proteins. Canned salmon contains no carbohydrates, the third basic nutrient. Three oz., about 85g, of canned pink salmon contains 5.1 g of total fat. This includes 1.3 g of saturated fats, the unhealthy kind that can block and clog arteries by producing LDL cholesterol. The remaining fats are heart-healthy unsaturated fats. According to Harvard nutritionist Walter Willett, the important aspect of fats in a food is the ratio of good fats to bad, not the raw amount of any given fat type. Pink salmon, like most fish, are rich in omega-3 fatty acids. One portion contains 1493 mg of this heart- and brain- healthy compound. One serving of canned, pink salmon contains 16.8 g of protein, just over one-third of your USDA recommended daily intake. As an animal protein, these are complete proteins. They deliver all of the amino acids your body needs, but can't make for itself. Canned, pink salmon delivers no carbohydrates. Canned, pink salmon is incredibly rich in vitamin D. Just one 3-oz. serving delivers more than 100 percent of your daily allowance. Along with the vitamin D, one serving brings 62 percent of your vitamin B12, 40 percent of your selenium, 28 percent of your phosphorus and niacin, and 13 percent of your vitamin B6. Canned, pink salmon also delivers smaller, but appreciable, amounts of riboflavin, folate, pantothenic acid, iron, calcium, potassium, zinc and copper. This does come at the cost of 471 mg of sodium per serving -- 20 percent of your daily allowance. Because of pollution levels in the ocean, parenting books "Baby 411" and "Expecting 411" caution expectant mothers from eating fish. Toxins, especially mercury, found in many fish may cause birth defects. Although wild Alaskan salmon is considered among the safest fish to eat, the risk for pregnant women exceeds the potential rewards. Is Orange Roughy Safe to Eat?